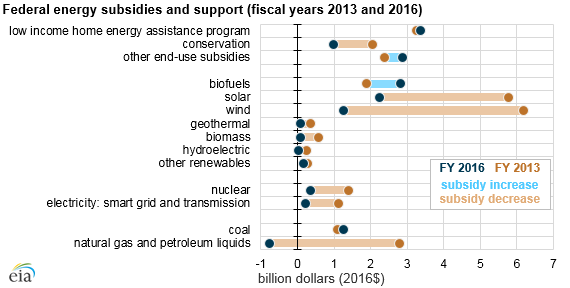 EIA has updated its report on federal financial interventions and subsidies in energy markets, covering the 2016 U.S. government fiscal year (FY). Subsidies for many energy categories have declined since FY 2013, when spending related to the American Recovery and Reinvestment Act of 2009 was at or near its highest levels. Between fiscal years 2013 and 2016, direct federal financial interventions and subsidies in energy markets decreased by nearly half, from $29.3 billion in FY 2013 to $15.0 billion in FY 2016. Between FY 2013 and FY 2016, the share of tax expenditures as part of total financial interventions and subsidies increased from 44% to 59%, while the share of direct expenditures declined from 46% to 31%. This shift reflects both decreasing direct expenditures for renewable electricity and increasing tax expenditures for renewable liquids fuels for transportation, particularly biofuel production tax provisions. In particular, the decrease in direct expenditures for renewable sources of electricity reflects the expired temporary government program that revised tax credits for a growing solar power industry, allowing subsidy applicants to receive grants in lieu of tax credits. These grants, known as Energy Investment Grants (or Section 1603 grants), were one of the few energy subsidy programs created by American Recovery and Reinvestment Act of 2009 that had a substantial budgetary impact in FY 2013. The application period for this temporary program has ended, but outlays for some projects continued into FY 2016. These Energy Investment Grants decreased by $7.7 billion between FY 2013 and FY 2016 as this temporary program ended. Wind subsidies decreased the most, falling from $6.2 billion in FY 2013 to $1.3 billion in FY 2016. Solar subsidies also decreased, from $5.8 billion in FY 2013 to $2.2 billion in FY 2016. Both wind and solar continue to be eligible for production tax credits. Federal subsidy support for fossil fuels declined from almost $3.9 billion in FY 2013 to $489 million in FY 2016. Within those fossil fuel subsidies, support for coal slightly increased, while support for natural gas and petroleum liquids decreased substantially. In FY 2016, certain tax provisions related to oil and natural gas yielded positive revenue flow for the government, resulting in a negative net subsidy of $773 million, based on estimates from the U.S. Department of Treasury. Funding for the Low Income Home Energy Assistance Program (LIHEAP) subsidy, which represented the single largest direct expenditure program in FY 2016, was relatively stable between FY 2013 and FY 2016. LIHEAP assists low income households in meeting their immediate home energy needs for heating and cooling.